I have a new commission which is great because I love commissions. It gives me the chance to work to a brief and collaborate with my client at the same time. In this case my clients are Michael and Claire who are friends of mine. Apparently they have a very, very ugly sofa they wish to cover up with something pretty. I suggested at first to buy a nice throw but they want a quilt because that also gives them a chance to snuggle up under. Basically two curved parts in the top left and bottom right corner that are pieced from patterned and solid fabrics all in shades of red. 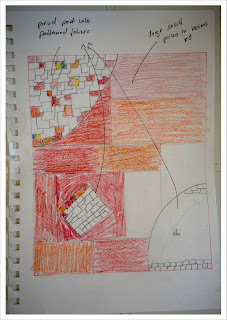 Then one small pieced item in the middle and the entire thing is connected by large blocks in various shades of red solids. This will challenge me in terms of curve sewing but also and here is the catch in terms of size. The quilt has to be 3.2 x 2.5 m that is 126 x 98 inches ! I have shown Claire the design and she approves (phew !) and we also looked at patterned fabric and solids. I took along my Kona shade card which helped enormously. 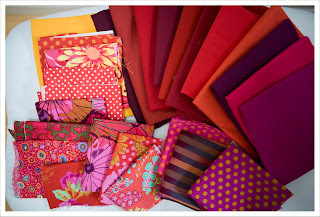 And this is the fabric selection I am going to be using with 'Berry Red' (that is how I named the quilt). To the right are a number of K. Fassett and Philip Jacobs prints amongst some others. 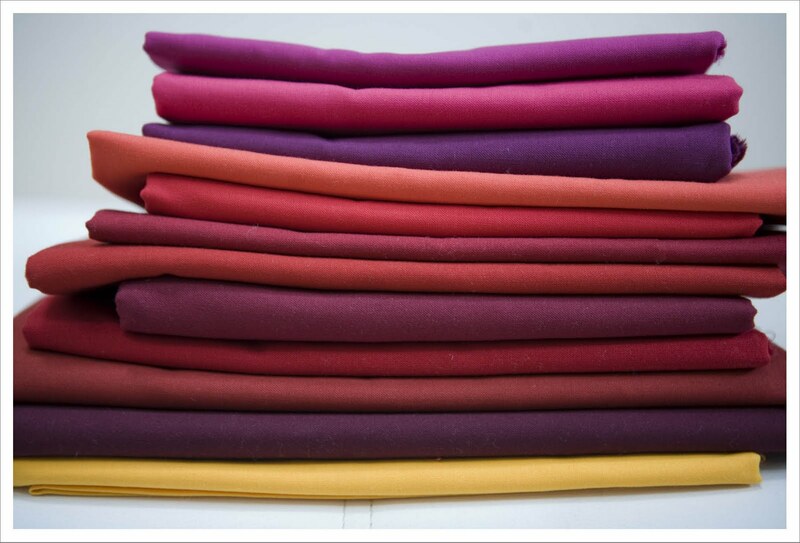 I think I will also use the odd dark yellow or cream piece to accentuate. My hope is although this selection here looks quite intense and wild that the overall effect of the quilt is a lot calmer with some small bursts of excitement (ie. the corner sections) as the solid parts joining the two corners are rather on the large side due to its size. What do you think ? I would appreciate some advice and honest thoughts from you my wonderful readers. Ahem...........................and here comes the bit about the interview. The lovely Rhonda from Quilter in the Gap asked me a while ago if I would agree to be interviewed and God only knows why but I agreed. Rhonda did a great job putting a coherent story together from my garbled answers and she makes me look a lot cooler than I really am. I just listened to it and I would have never imagined that it is so excruciating having to listen to someone speaking about me in such a complimentary way. So if you want to hear a a bit about me then hop over to Rhonda and have a look and listen. She is a great story teller and has produced three podcasts so far that are fantastic to listen to. 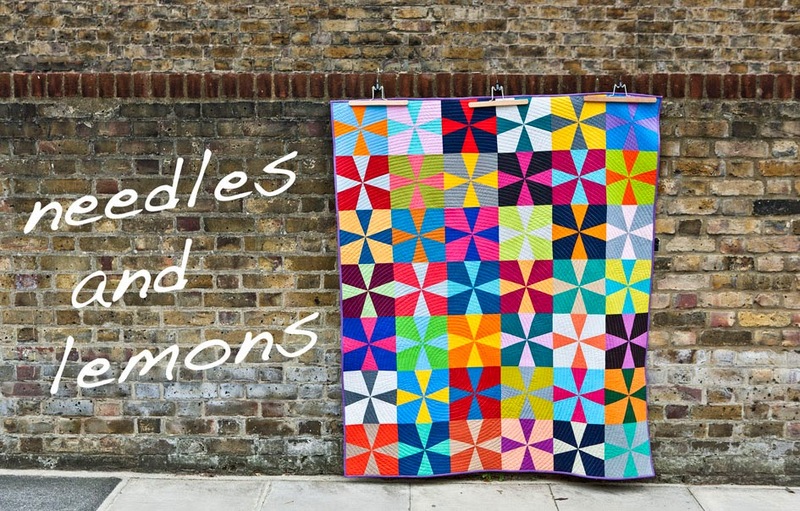 The best thing though is that there is lots of other stuff on the podcast, one of them is something about free-motion quilting and here experience on the longarm quilter. I am liking your concept, and I loved that interview. Wine gum anybody? I love the design but can't comment on doing big quilts - let alone HUGE ones - because I am too chicken to take one on. I have neither the space nor the patience at this point in my life. Maybe one day if I have a room dedicated to me and only me rather than taking over the dining room when I can. Maybe! The largest I have made are twins and I am about to do a queen. I love the color palette:):) The only obvious thing with all that red would lead me to definitely prewash all of it-lol! 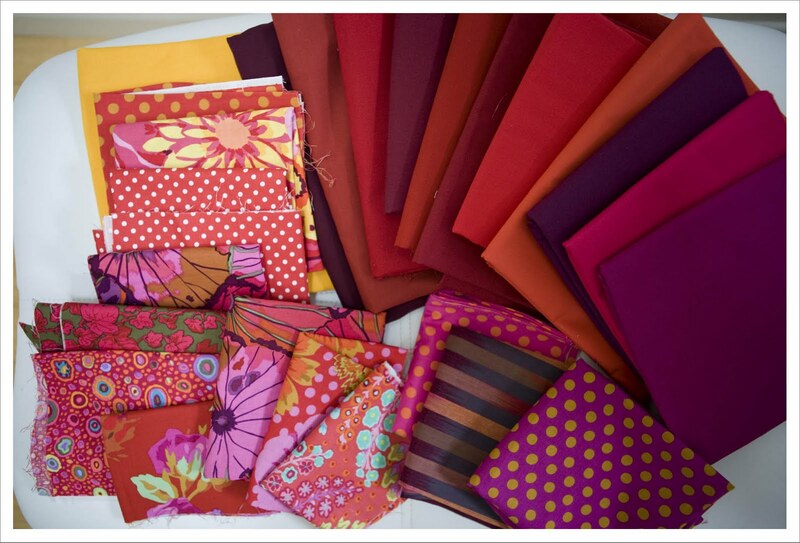 I am going to be doing my first commission quilt soon. Wondering if you have any advice on pricing or any other area? Ooooh the design is great, and the colour choice is really fabulous, I love it. Had you considered looking to see if there were any good reds in crossweave or shot cotton? Maybe give a little texture to the solid reds? (if that makes sense.) And as for your interview, I loved it! Apparently I'm next - I have told Rhonda that putting me after you and Lynne is a bit like following a gourmet dinner with squirty aerosol cream... but there you go. I love your concept! I did a whole red quilt, using about 30 colours, and I include yellow and orange and purple and pink and burgundy and almost brown, and each of those just added more depth to the red. So my only suggestion is a few more colours, if you wanted them. I look forward to seeing it after you make it.